by Chris Woodford. Last updated: September 24, 2018. Is your memory like an elephant's... or is it more like a sieve? You often hear people comparing themselves to one of those things, but you almost never hear someone say their memory is like a computer. That's partly because human brains and computer memories have very different purposes and operate in quite different ways. But it also reflects the fact that where we humans often struggle to remember names, faces, and even the day of the week, computer memories are the closest thing we have to memory perfection. How exactly do these "remarkable rememberers" actually work? Let's take a closer look! Photo: A computer memory chip like this is an example of an integrated circuit. That means it's a miniaturized collection of thousands of electronic parts (usually called components) created on a tiny chip of silicon about the size of a pinkie nail. 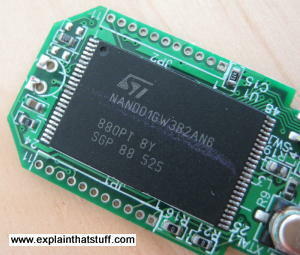 This one is a 1-gigabit NAND flash memory chip from a USB memory stick. 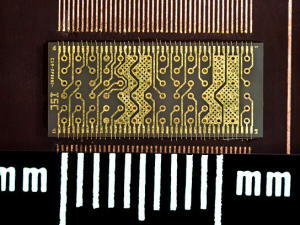 Photo: Computers remember things in a very different way from human brains, although it is possible to program a computer to remember things and recognize patterns in a brain-like way using what are called neural networks. 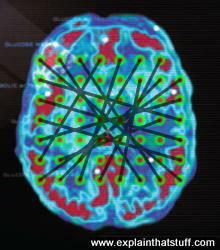 Brain scan photo courtesy of National Institute on Drug Abuse and National Institutes of Health (NIH) with neural network pattern by explainthatstuff.com. The basic purpose of memory—human or machine—is to keep a record of information for a period of time. One of the really noticeable things about human memory is that it's extremely good at forgetting. That sounds like a major defect until you consider that we can only pay attention to so many things at once. In other words, forgetting is most likely a clever tactic humans have evolved that helps us to focus on the things that are immediately relevant and important in the endless clutter of our everyday lives—a way of concentrating on what really matters. Forgetting is like turning out old junk from your closet to make room for new stuff. Computers don't remember or forget things the way that human brains do. Computers work in binary (explained more fully in the box below): they either know something or they don't—and once they've learned, barring some sort of catastrophic failure, they generally don't forget. Humans are different. We can recognize things ("I've seen that face before somewhere") or feel certain that we know something ("I remember learning the German word for cherry when I was at school") without necessarily being able to recollect them. Unlike computers, humans can forget... remember... forget... remember... making memory seem more like art or magic than science or technology. When clever people master tricks that allow them to memorize thousands of pieces of information, they're celebrated like great magicians—even though what they've achieved is far less impressive than anything a five-dollar, USB flash memory stick could do! One thing human brains and computers do have in common is different types of memory. Human memory is actually split into a short-term "working" memory (of things we've recently seen, heard, or processed with our brains) and a long-term memory (of facts we've learned, events we've experienced, things we know how to do, and so on, which we generally need to remember for much longer). A typical computer has two different kinds of memory as well. There's a built-in main memory (sometimes called internal memory), made up of silicon chips (integrated circuits). It can store and retrieve data (computerized information) very quickly, so it's used to help the computer process whatever it's currently working on. Generally, internal memory is volatile, which means it forgets its contents as soon as the power is switched off. That's why computers also have what's called auxiliary memory (or storage) as well, which remembers things even when the power is disconnected. In a typical PC or laptop, auxiliary memory is generally provided by a hard drive or a flash memory. Auxiliary memory is also called external memory because in older, larger computers, it was typically housed in a completely separate machine connected to the main computer box by a cable. In a similar way, modern PCs often have plug-in auxiliary storage in the form of USB flash memory sticks, SD memory cards (which plug into things like digital cameras), plug in hard-drives, CD/DVD ROMs and rewriters and so on. Photo: These two hard drives are examples of auxiliary computer memory. On the left, we have a 20GB PCMCIA hard drive from an iPod. On the right, there's a somewhat bigger 30GB hard-drive from a laptop. The 30GB hard drive can hold about 120 times more information than the 256MB flash memory chip in our top photo. 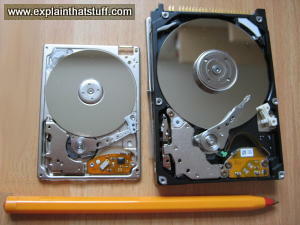 See more photos like this in our main article on hard drives. In practice, the distinction between main memory and auxiliary memory can get a little blurred. Computers have a limited amount of main memory (typically somewhere between 512MB and 4GB on a modern computer). The more they have, the more quickly they can process information, and the faster they get things done. If a computer needs to store more space than its main memory has room for, it can temporarily move less important things from the main memory onto its hard drive in what's called a virtual memory to free up some space. When this happens, you'll hear the hard drive clicking away at very high speed as the computer reads and writes data back and forth between its virtual memory and its real (main) memory. Because hard drives take more time to access than memory chips, using virtual memory is a much slower process than using main memory—and it really slows your computer down. That's essentially why computers with more memory work faster. Photo: Most memory chips are two dimensional, with the transistors (electronic switches) that store information laid out in a flat grid. By contrast, in this 3D stack memory, the transistors are arranged vertically, as well as horizontally, so more information can be packed into a smaller space. Photo courtesy of NASA Langley Research Center (NASA-LaRC). The chips that make up a computer's internal memory come in two broad flavors known as RAM (random access memory) and ROM (read-only memory). RAM chips remember things only while a computer is powered on, so they're used for storing whatever a computer is working on in the very short term. ROM chips, on the other hand, remember things whether or not the power is on. They're preprogrammed with information in the factory and used to store things like the computer's BIOS (the basic input/output system that operates fundamental things like the computer's screen and keyboard). RAM and ROM are not the most helpful names in the world, as we'll shortly find out, so don't worry if they sound baffling. Just remember this key point: the main memory inside a computer is based on two kinds of chip: a temporary, volatile kind that remembers only while the power is on (RAM) and a permanent, nonvolatile kind that remembers whether the power is on or off (ROM). Today's machines have vastly more RAM than early home computers. This table shows typical amounts of RAM for Apple computers, from the original Apple I (released in 1976) to the iPhone 7 smartphone (released four decades later) with almost 400,000 times more RAM onboard! Here, the prefix K = 1024 bytes, so 128K = 131,072 bytes. 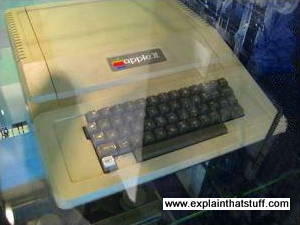 Photo: The Apple ][ had a basic 4K of memory, expandable to 48K. That seemed a huge amount at the time, but a modern smartphone has about 60,000 times more RAM than its 48K predecessor. In 1977, a 4K RAM upgrade for an Apple ][ cost a whopping $100, which works out at $1 for 41 bytes; in 2016, it's easy to find 1GB for $10, so $1 buys you over 100MB—about 25 million times more memory for your money! This is where things can get slightly confusing. RAM has the name random access because (in theory) it's just as quick for the computer to read or write information from any one part of a RAM memory chip as from any other. (Incidentally, that applies just as much to most ROM chips, which you could say are examples of nonvolatile, RAM chips!) Hard drives are also, broadly speaking, random-access devices, because it takes roughly the same time to read information from any point on the drive. Not all kinds of computer memory is random access, however. It used to be common for computers to store information on separate machines, known as tape drives, using long spools of magnetic tape (like giant-sized versions of the music cassettes in old-fashioned Sony Walkman cassette players). If the computer wanted to access information, it had to spool backward or forward through the tape until it reached exactly the point it wanted—just like you had to wind back and forth through a tape for ages to find the track you wanted to play. If the tape was right at the beginning but the information the computer wanted was at the very end, there was quite a delay waiting for the tape to spool forward to the right point. If the tape just happened to be in the right place, the computer could access the information it wanted pretty much instantly. Tapes are an example of sequential access: information is stored in sequence and how long it takes to read or write a piece of information depends where the tape happens to be in relation to the read-write head (the magnet that reads and writes information from the tape) at any given moment. 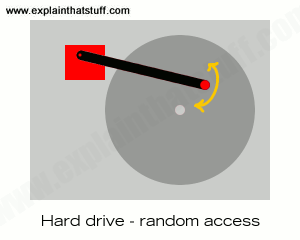 Picture: 1) Random access: A hard drive can read or write any piece of information in more or less the same amount of time, just by scanning its read-write head back and forth over the spinning platter. 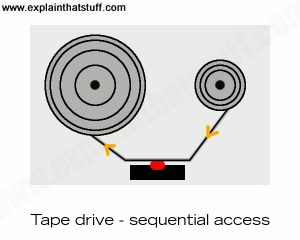 2) Sequential access: A tape drive has to spool the tape backward or forward until it's at the right position before it can read or write information. RAM comes in two main varieties called DRAM (dynamic RAM) and SRAM (static RAM). DRAM is the less expensive of the two and has a higher density (packs more data into a smaller space) than SRAM, so it's used for most of the internal memory you find in PCs, games consoles, and so on. SRAM is faster and uses less power than DRAM and, given its greater cost and lower density, is more likely to be used in the smaller, temporary, "working memories" (caches) that form part of a computer's internal or external memories. It's also widely used in portable gadgets such as cellphones, where minimizing power consumption (and maximizing battery life) is extremely important. The differences between DRAM and SRAM arise from the way they're built out of basic electronic components. Both types of RAM are volatile, but DRAM is also dynamic (it needs power to be zapped through it occasionally to keep its memory fresh) where SRAM is static (it doesn't need "refreshing" in the same way). DRAM is more dense (stores more information in less space) because it uses just one capacitor and one transistor to store each bit (binary digit) of information, where SRAM needs several transistors for each bit. Like RAM, ROM also comes in different varieties—and, just to confuse matters, not all of it is strictly readonly. The flash-memory you find in USB memory sticks and digital camera memory cards is actually a kind of ROM that retains information almost indefinitely, even when the power is off (much like conventional ROM) but can still be reprogrammed relatively easily whenever necessary (more like conventional RAM). Technically speaking, flash memory is a type of EEPROM (electrically erasable programmable ROM), which means information can be stored or wiped out relatively easily just by passing an electric current through the memory. Hmmm, you might be thinking, doesn't all memory work that way... by passing electricity through it? Yes! But the name is really a historic reference to the fact that erasable and reprogrammable ROM used to work a different way. Back in the 1970s, the most common form of erasable and rewritable ROM was EPROM (erasable programmable ROM). EPROM chips had to be erased by the relatively laborious and inconvenient method of first removing them from their circuit and then blasting them with powerful ultraviolet light. Imagine if you had to go through that longwinded process every time you wanted to store a new set of photos on your digital camera memory card. Gadgets such as cellphones, modems, and wireless routers often store their software not on ROM (as you might expect) but on flash memory. That means you can easily update them with new firmware (relatively permanent software stored in ROM), whenever an upgrade comes along, by a process called "flashing." As you may have noticed if you've ever copied large amounts of information to a flash memory, or upgraded your router's firmware, flash memory and reprogrammable ROM works more slowly than conventional RAM memory and takes longer to write to than to read. 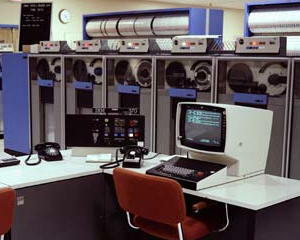 Photo: This is the operator's terminal of an IBM System/370 mainframe computer dating from 1981. You can see a bank of five tape drives whirring away in the background and, behind them, cupboards filled with stored tapes. If the computer needed to read some really old data (say, last year's payroll records or a backup of data made a few days ago), a human operator had to search for the correct tape in the cupboard and then "mount it" (load it into the drive) before the machine could read it! We still talk about "mounting" discs and drives to this day, even when all we mean is getting a computer to recognize some part of its memory that isn't currently active. Photo courtesy of NASA Glenn Research Center (NASA-GRC). The most popular kinds of auxiliary memory used in modern PCs are hard drives and CD/DVD ROMs. But in the long and fascinating history of computing, people have used all kinds of other memory devices, most of which stored information by magnetizing things. Floppy drives (popular from about the late-1970s to the mid-1990s) stored information on floppy disks. These were small, thin circles of plastic, coated with magnetic material, spinning inside durable plastic cases, which were gradually reduced in size from about 8 inches, through 5.25 inches, down to the final popular size of about 3.5 inches. Zip drives were similar but stored much more information in a highly compressed form inside chunky cartridges. In the 1970s and 1980s, microcomputers (the forerunners of today's PCs) often stored information using cassette tapes, exactly like the ones people used back then for playing music. You might be surprised to hear that big computer departments still widely use tapes for backing up data today, largely because this method is so simple and inexpensive. It doesn't matter that tapes work slowly and sequentially when you're using them for backups, because generally you want to copy and restore your data in a very systematic way—and time isn't necessarily that critical. Photo: Memory as it used to be in 1954. This closet-sized magnetic core memory unit (left), as tall as an adult, was made up of individual circuits (middle) containing tiny rings of magnetic material (ferrite), known as cores (right), which could be magnetized or demagnetized to store or erase information. Since any core could be read from or written to as easily as any other, this was a form of random access memory. Photos courtesy of NASA Glenn Research Center (NASA-GRC). Going back even further in time, computers of the 1950s and 1960s recorded information on magnetic cores (small rings made from ferromagnetic and ceramic material) while even earlier machines stored information using relays (switches like those used in telephone circuits) and vacuum tubes (a bit like miniature versions of the cathode-ray tubes used in old-style televisions). Photos, videos, text files, or sound, computers store and process all kinds of information in the form of numbers, or digits. That's why they're sometimes called digital computers. Humans like to work with numbers in the decimal (base 10) system (with ten different digits ranging from 0 through 9). Computers, on the other hand, work using an entirely different number system called binary based on just two numbers, zero (0) and one (1). In the decimal system, the columns of numbers correspond to ones, tens, hundreds, thousands, and so on as you step to the left—but in binary the same columns represent powers of two (two, four, eight, sixteen, thirty two, sixty four, and so on). So the decimal number 55 becomes 110111 in binary, which is 32+16+4+2+1. You need a lot more binary digits (also called bits) to store a number. With eight bits (also called a byte), you can store any decimal number from 0–255 (00000000–11111111 in binary). Artwork: 55 in decimal is equal to (1×32) + (1×16) + (0×8) + (1×4) + (1×2) + (1×1) = 110111 in binary. A computer doesn't have any flags inside it, but it can store the number 55 with six transistors switched on or off in the same pattern. So storing numbers is easy. But how can you add, subtract, multiply, and divide using nothing but electric currents? You have to use clever circuits called logic gates, which you can read all about in our logic gates article. Here are just a few selected milestones in the development of computer memory; for the bigger picture, please check out our detailed article on the history of computers. 1804: Joseph Marie Jacquard uses cards with holes punched into them to control textile-weaving looms. Punched cards, as they're known, survive as an important form of computer memory until the early 1970s. 1835: Joseph Henry invents the relay, an electromagnetic switch used as a memory in many early computers before transistors are developed in the mid-20th century. 19th century: Charles Babbage sketches plans for elaborate, gear-driven computers with built-in, mechanical memories. 1947: Three US physicists, John Bardeen, Walter Brattain, and William Shockley, develop the transistor—the tiny switching device that forms the heart of most modern computer memories. 1949: An Wang files a patent for magnetic core memory. 1950s: Reynold B. Johnson of IBM invents the hard drive, announced to the public on September 4, 1956. 1967: IBM's Warren Dalziel develops the floppy drive. 1960s: James T. Russell invents the optical CD-ROM while working for Battelle Memorial Institute. 1968: Robert Dennard of IBM is granted a patent for DRAM memory. 1981: Toshiba engineers Fujio Masuoka and Hisakazu Iizuka file a patent for flash memory. The Essentials of Computer Organization and Architecture by Linda Null et al. Jones & Bartlett, 2014. A comprehensive, basic introduction to computer science. Chapter 6 covers memory, including virtual memory and paging. PC Mods for the Evil Genius by Jim Aspinwall. McGraw-Hill Professional, 2006. A simple introduction to hacking a basic PC into something slightly more interesting. Build Your Own Computer by Gary Marshall. Haynes, 2012. A simple illustrated guide to building a PC, written in the familiar Haynes car manual style. PCs All-in-One For Dummies by Mark L. Chambers. John Wiley & Sons, Jun 2010. A Dummies-style introduction covering all aspects of PCs, from using Windows and installing simple applications like Excel to full-scale memory upgrades. Why the Future of Data Storage is (Still) Magnetic Tape by Mark Lantz. IEEE Spectrum, August 28, 2018. Dependable magnetic tape is much more relevant to "big data" storage than you might think. Software as Hardware: Apollo's Rope Memory by David C. Brock. IEEE Spectrum, September 29, 2017. A fascinating look at the magnetic core memory used in the Apollo spacecrafts. US Patent 2,708,722: Pulse transfer controlling device by An Wang. May 17, 1955. The original magnetic core memory. US Patent 3,134,097: Data storage machine by Louis D. Stevens, William A. Goddard, and John J. Lynott. May 19, 1964. IBM's original hard drive patent, originally filed a decade earlier (on December 24, 1954). US Patent 3,503,060: Direct access magnetic disc storage device by William A. Goddard and John J. Lynott, IBM. March 24, 1970. One of IBM's later hard drive ("DASD") patents and incorporating quite a bit from the earlier US Patent 3,134,097. This one is hugely detailed—you could almost build a hard drive by following it carefully! US Patent 3,387,286: Field-effect transistor memory by Robert Dennard, IBM. June 4, 1968. The key components of DRAM memory are memory cells for storing individual bits of information, each made from one FET and one capacitor, as explained here in the original patent.